Loch Ness "world's biggest spirit level"
The BBC have posted a piece on how scientists have used Loch Ness to measure the minute effects of tidal forces on the loch's water levels. The sun and moon's combined gravitational force raises and drops the water level by as much as 1.5mm in a day. The other interesting note is that the Foyers power station alone does the same thing by 4cm a day. I would add my own note that when using a trap camera before and after heavy rain, the difference in loch levels was even more noticeable. As mentioned in a previous blog, the famous "courtship" painting of the Loch Ness Monster by Sir Peter Scott is going under the hammer on the 22nd January. The auction item is now listed online by the auctioneers Christies and can be viewed here. The estimated price is £1500-£2500. A Happy New Year to all readers, both believers and sceptics alike! We'll kick off 2012 with an experience from 51 years ago. I was in communication with a former pupil of the school at Fort Augustus Abbey named Sean O' Donovan who lived as a boy at Easter Balnaban which is outside Drumnadrochit and up the hillside. "I certainly saw a 'something', although I was too far away (about 500 ft up a mountainside and perhaps half a mile as the crow flies) for any minute detail, moving out from beneath Urquhart Castle across the Loch. Whatever it was appeared to be the size of a decent sized rowing boat and left a wake. It vanished mid-way across the Loch. The monster?" 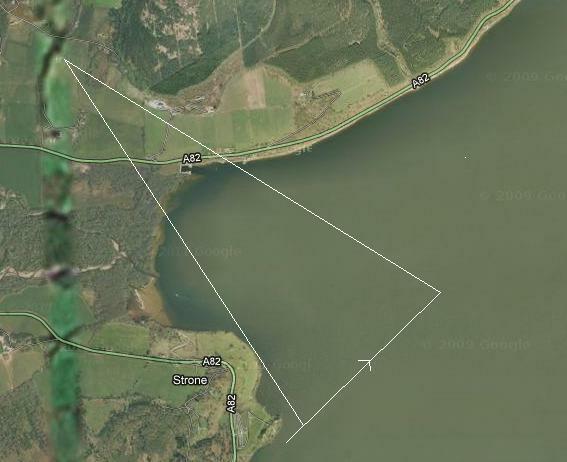 I put together a rough map of where this object perhaps first appeared and disappeared (but it may have moved further into Urquhart Bay than centre loch). "I happened to be gazing out across the loch when I saw a 'shape' (no more definition than that and no different in colour from the water) move out from the bank at perhaps 6 knots? It left a clear wake, as would a small boat and my first assumption was that it was indeed a boat in shadow but when it reached the midway point of the loch it vanished." Do boats normally vanish as they ply their voyage? Obviously not, but then again perhaps a boat did indeed sink but we doubt that. A decent sized rowing boat can be up to fifteen feet in length and four feet across. Sightings of the Loch Ness Monster in its single hump aspect are often compared to the dimensions of a rowing boat. "I have since read an explanation for my 'sighting' and others. Basically it has to do with the structure of the Loch and the existence in it of two distinct layers of water. Around 600AD ( I think) there was a ship-burial of a Norse chieftain and the waterlogged keel of the ship would still exist as there is little oxygen in the depths to rot it. Currents in the loch still bring this keel to the surface temporarily and the dragon's head with which such boats were often decorated would account for those who have seen a 'head' with the length of the keel accounting for those that see a 'hump'. Make of that what you will but it fits with what I saw." Looking out from the shore, the interested spectator will have seen an animal head with a long neck emerge from the water and travel through the waves for a few yards before sinking from sight again leaving, in many cases, an impression of a long curved back or hump before disappearing completely from view. Remind you of anything? This is the only explanation for a Loch Ness Monster which fits the vast majority of sightings (the dinosaur-like creature crossing the main road at dead of night with a sheep in its mouth being a notable exception). There is unlikely to be more than one Drakar keel down there so whether one sees on the surface a long curved back or a shorter more pronounced hump will depend on whether the keel has any forward motion when it inverts. The Ness has always been a great river for salmon but man is not alone among their predators. It shares a similar latitude, a couple of degrees below the 60th parallel, with Kodiak Island in Alaska, a place that gave its name to a member of the best known species of salmon fishing animal in the world, the brown bear. In Columba’s time the bear had been extinct in Ireland for centuries so it is not an animal with which he and his fellow Irishmen would have been in any way familiar. But although it would not vanish from Scotland for a few generations yet, it was by this time, in the latter part of the sixth century, a rarity. With so much impenetrable woodland for cover, it would have been perfectly at home on the banks of the Ness and, like its North American cousins, would seek its favourite food where the water is shallow, the flow narrow and the passing salmon most easily caught. Rising in the water from all fours onto its two hind legs, it would certainly give the appearance of a beast rising from beneath the waves, all the more so if viewed indistinctly through a screen of greenery. More than capable of killing a man if surprised, or interrupted whilst feeding, a brown bear would generally seek to avoid contact with humans, thus its readiness to flee at the sound of Columba’s voice. Taken with Adomnan’s reference to the dead man having been mauled and the beast’s emitting of a roar, all the evidence points in only one direction and that is not towards a loch-dwelling monster. This was not the first recorded sighting in Scotland of a monster but the last recorded sighting of a bear. I would presume a boat of these proportions would have been found with sonar by now. But then again, perhaps Loch Ness has more than one secret in those dark depths. But I am also afraid I disagree with Mr. Campbell's assessment of Nessie sightings and St. Columba's memorable encounter! "I always thought that the incident of Fr. John Baptist taking his boat 'The Goose' out on a fishing trip supposedly returning by 4pm, not returning until the next morning with a large hole in the bow. He claimed that his boat was damaged by a 'sea creature', in the middle of the night, This was in '54 just before tourist season when the fund raising was in progress for the church. When I asked him why he did not come back at 4pm when he was due he said I was too smart and not to mention that to anyone. After all a priest seeing the 'Sea Creature' would never be questioned."